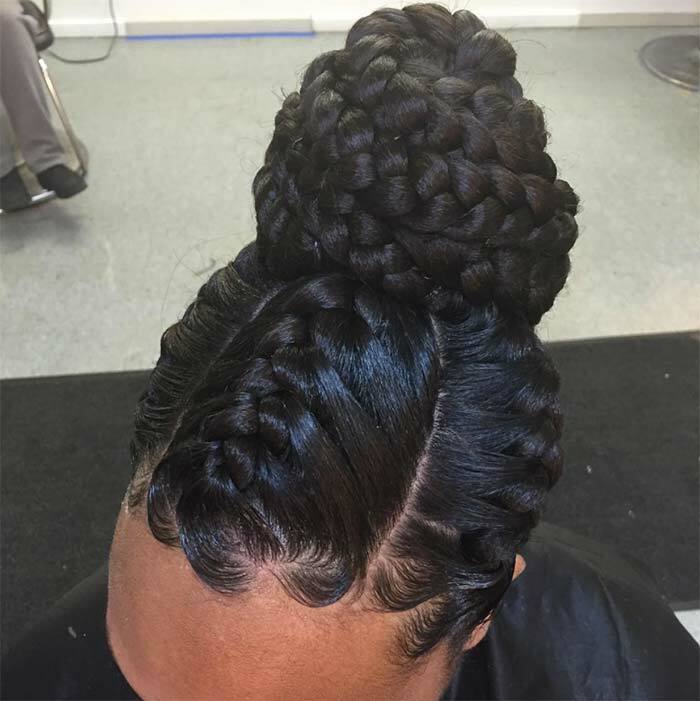 Goddess braids have been a staple hairstyle option for women with black hair for as far back as any of us know. Even if traditionally black hairstyles are not the type you are interested in, the option has been presented and there are several reasons why. 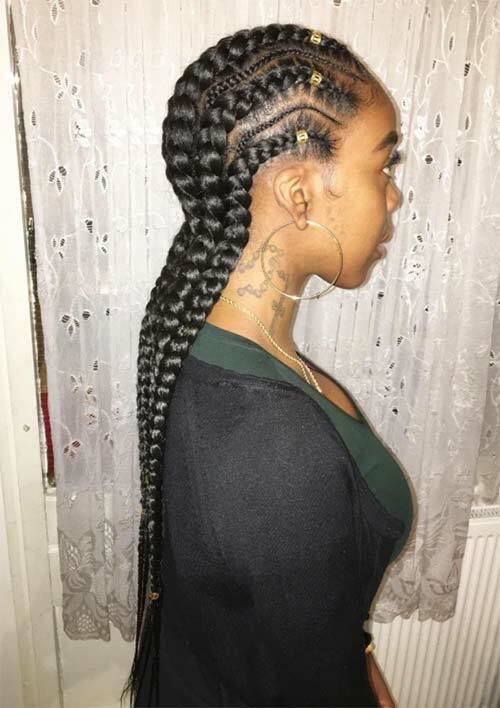 Goddess braided hairstyles are considered as iconic as taper fade styles are for Afro American man but also an excellent way to give your hair a break, retain length and moisture and are considered a great and stylish protective style option. As a kid I remember being incredibly excited to get my hair done, choosing one of a million different goddess braided hairstyles and being so excited to show off my new look at school. This is the narrative for a lot of girls, even when people considered it to be too weird, or out of place or odd that we wore the same style for weeks, it always gave me a sense of pride and was a way to show off my individual style. 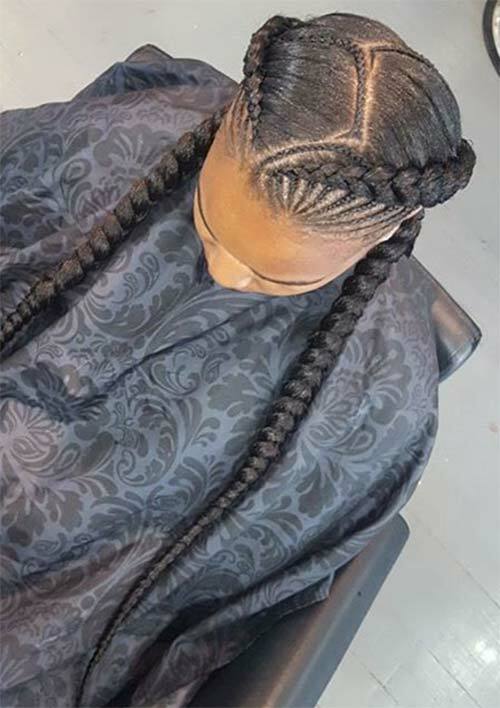 Some people learn how to do certain variations of goddess braids on their own, but for really intricate designs it is best to go to a professional braider and get the whole install taken care of. Unless you have amazing arm strength and endurance, you’ll greatly appreciate the professional help. If you are interested in goddess braids, but don’t know where to start, hopefully this article will be a big help. Consider this the informative guide for goddess braided hairstyles, complete with several style options for inspiration at the end. Goddess braids are large to oversized braids designed to work as a protective style for black hair. They can be cornrows or individuals, but it is the design that really matters. They are suitable for both natural and relaxed hair regardless of additional processes like coloring. For those trying to grow out their hair, transition from relaxed to natural or just give their hair a break, goddess braids are certainly an option. Goddess braided hairstyles have a slew of benefits for installing them and they are very easy to maintain. 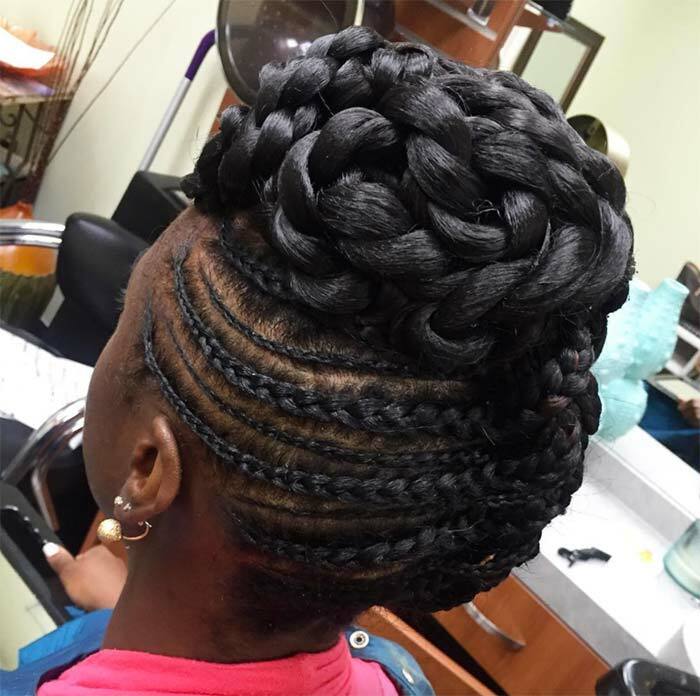 Other forms of braids inspired by goddess braided hairstyles are being seen everywhere. While braids have existed in many cultures for eons, the goddess braid hairstyles have a thorough history of their own. 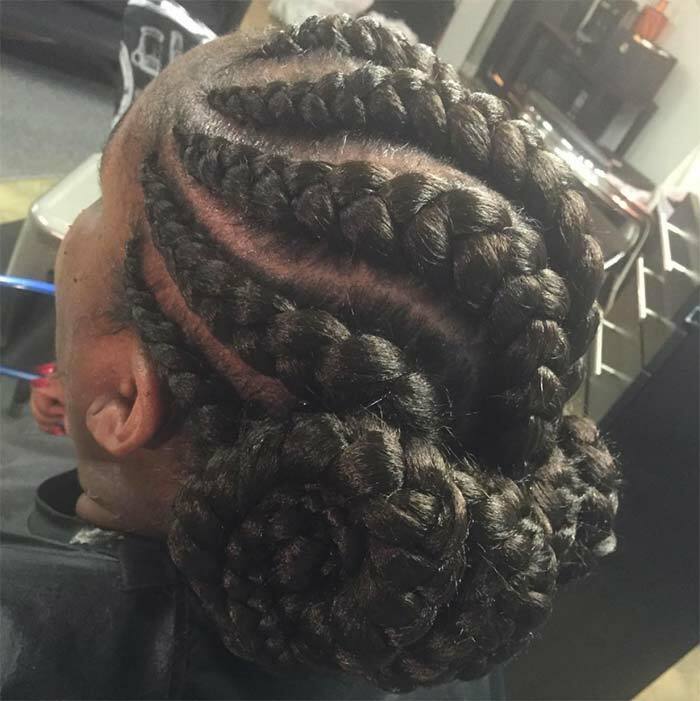 Just as braids have been able to convey social status and are perceived as art, even today, goddess braids show the time and diligence to get your hair done, a luxury. This isn’t a style that is meant to be installed in the morning and taken down the next day; it takes time, effort and intent and is supposed to last for one week to several weeks depending on the style. By giving your hair a break and tucking away the hair it promotes growth and prevents damage beautifully ” when it is done right. Why Are Goddess Braids a Good Protective Style? A good protective style is low maintenance, lasts at least a week, is low manipulation and gentle on hair. Goddess braids are easy on hair and work towards maintaining length by avoiding breakage and stress on the strands. Goddess braided hairstyles do not dry hair out, and are incredibly easy to maintain. Protective styling is also about retaining moisture while simultaneously protecting ends of hair from fraying and split ends. Goddess braids can last anywhere from one week to six weeks depending on the style. Goddess braided hairstyles are varied and easily adjustable. Every design can be worn several different ways. Low manipulation means you do not actually HAVE to style your hair, because it is already styled. Essentially, goddess braids are a get up and go’ hairstyle, i.e. low manipulation. 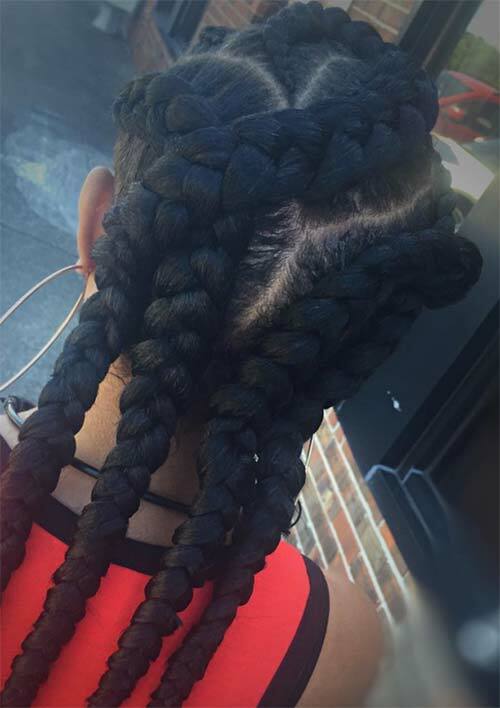 Because of the size of the braids, more of your actual hair is included in each braid or cornrow, creating a solid foundation and minimizing the likelihood that too much weight on small amounts of hair can cause tension issues. All styles of goddess braids tuck the hair in from root to end making it easier to properly moisturize, clean and maintain while it grows. How Are Goddess Braids Done? Goddess braided hairstyles are done a number of ways, each varying based on the intended final design. Cleaning the Hair: As with all protective styles, the first step is usually a deep clean of the hair and scalp with a clarifying shampoo and then a deep conditioning treatment. 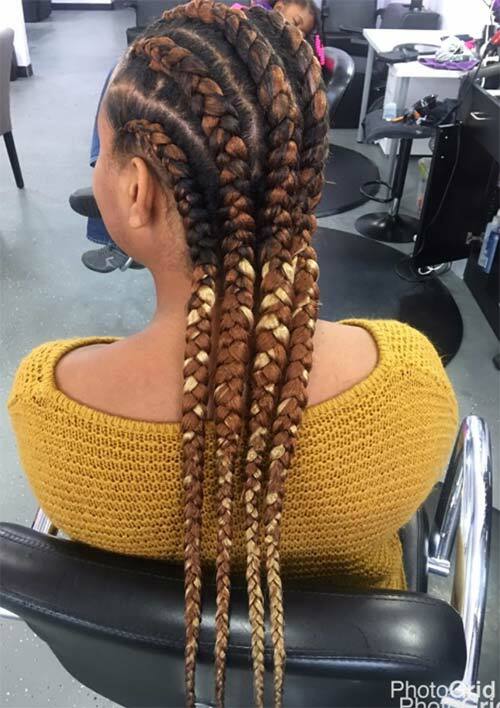 Conditioning: After the deep conditioning treatment, the hair is usually stretched (if natural) to create a smooth lead into and finish for the braids. Choosing the Ratio of the Braid: The ratio of hair for each braid is decided by the end design and parted to support the look. This happens whether additional hair extensions are added or not. Installing the Braids: Next the braids are installed, typically using a pomade or light gel depending on the hair type. Sealing the Braids: Finally, in the last step the ends of the goddess braids are sealed to keep the braids from coming loose and any hair jewelry or beads are installed as well. In most cases, especially where synthetic hair is used, the hair is sealed with hot water. In other cases, hair accessories can be installed to close the ends and in some cases, even a small inconspicuous knot is added at the end of the extensions to close the braid. This part is usually snipped off during takedown. Do take care of your hair while it is in braids. Spritz your hair with water and oil it. Use a specially formulated braid spray; just pay attention to the ingredients you use. Do adjust your routine. Washing, deep conditioning and moisturizing hair is still essential, but you will have easier access to your scalp and can continue to maintain without the worry of detangling, drying, styling, etc. Do be careful of your edges. 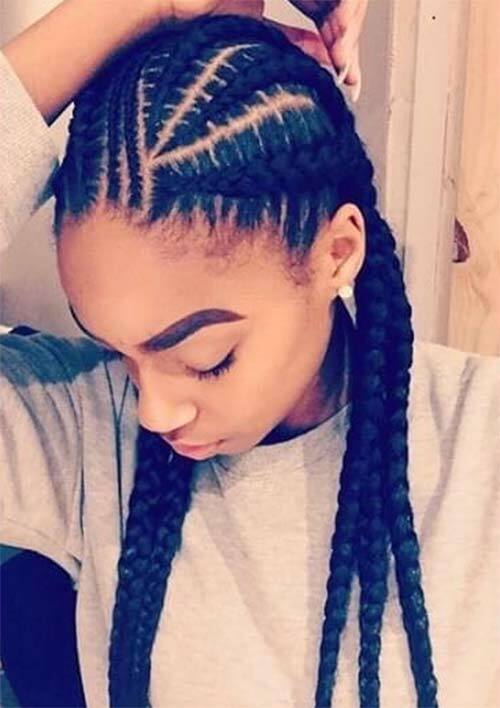 Many a hairline has been ruined by braids installed improperly around the edges. Do pay attention to the ratio ” extensions can add bulk and length, but adding too much without a good ratio of your hair will cause pulling as it grows out and create tension on the scalp, which can lead to bald spots. 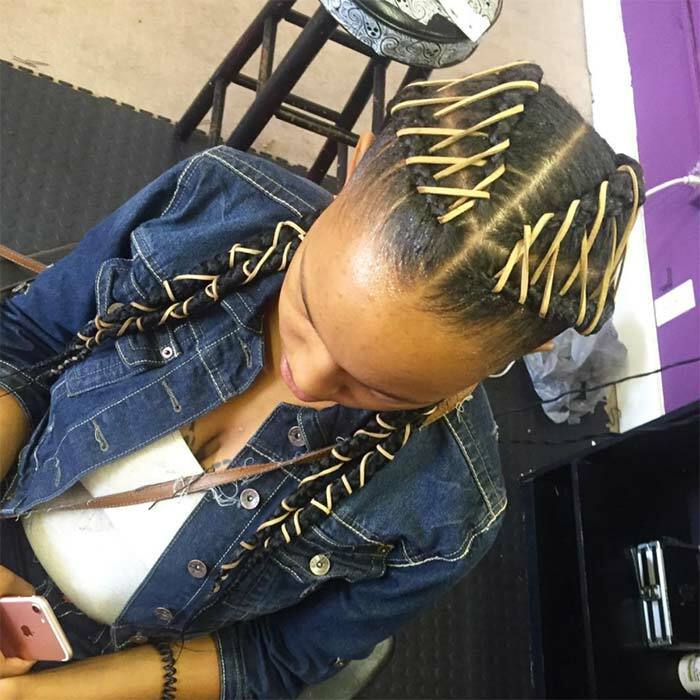 Do your research on braiding salons! Check out their most recent work on social media or go in for a consultation and see some of the results live. 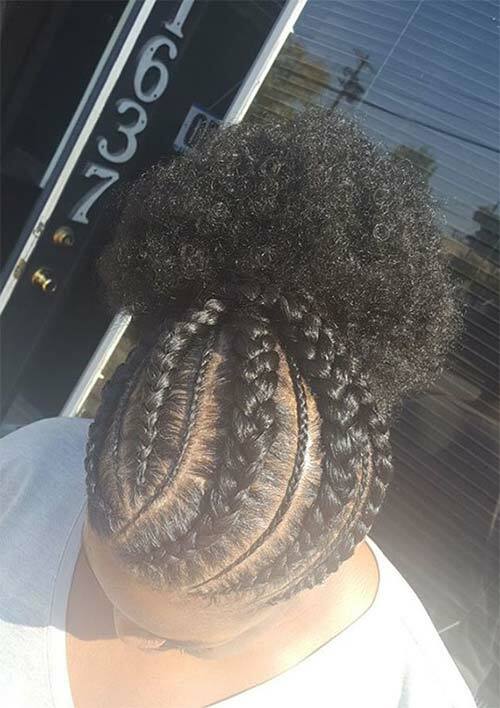 This is incredibly important as many braiding salons have a tendency to pull hair too tightly, which can lead to bald spots and traction alopecia. Hair should be braided tightly, but not too tightly. A puffy swollen scalp all the way to the hairline is unacceptable. Don’t overdo it on washing or conditioning. Don’t allow product buildup. This can stifle your hair growth, weaken your hair and cause your goddess braids to look dirty. Don’t fall for the idea that the tighter the hair is installed, the longer it will last. This is an exaggeration; tightly braided hair is secure, but hair braided too tightly will cause issues. I cannot state this often enough. Don’t wear the same goddess braid hairstyle each time, and space out installs with a minimum of one week’s rest for your hair. Ideally you should give yourself a month between protective styles. Expect to be there for hours if not all day. There are memes and jokes galore about going to the salon, and they are all accurate. A full install will include a wash and condition, stretching the hair and braiding and can take hours. 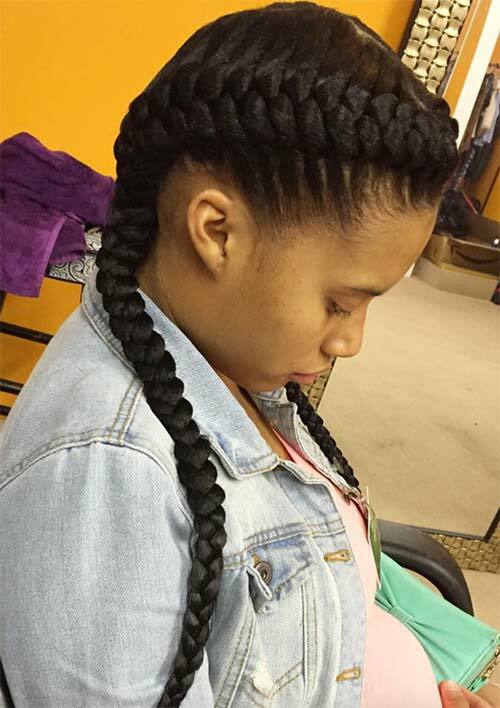 Depending on whether you are getting Individual box style goddess braids or a cornrowed goddess braid hairstyle, the length of time spent on braiding can vary by hours. A nearly all day commitment to the salon may seem like a sacrifice but remember this style will last you weeks. 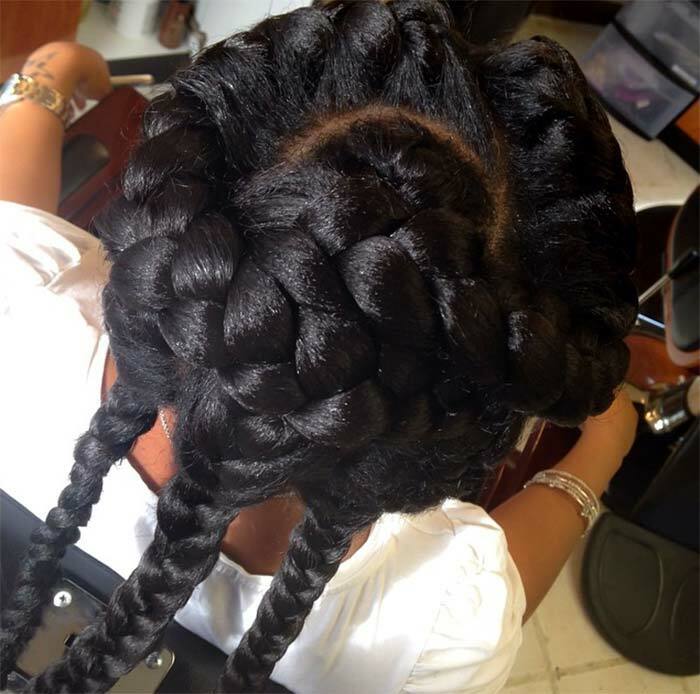 Make certain to discuss with your braider if the hair extensions are included or if you need to bring them with you. During the appointment, if you haven’t already chosen a style, you’ll have the chance to look at a few. It is never a bad idea to bring along any images of goddess braids for inspiration as well. Browse Pinterest, Instagram, wherever you can find a style you like (even in this article) and show it to your stylist for inspiration either before, so you can get a better quote, or during the actual appointment. Take a look while you are under the dryer if need be, it’s a great use of time. Once your hair is stretched, the hair is usually divided up, or parted into workable sections decided by the style you’ve chosen. Then comes the even bigger wait. If you are tender headed (which is a debatable topic, I know), take a pain killer first to ward it off and make the process easier. The addition of the hair is done in a variety of different ways, but if the ratio is right, it should not add too much weight so as to become uncomfortable. Listen to the stylist when your hair is being styled, they will give you insight on how to protect your hair and how to style your goddess braids, should you choose to. Most Goddess braid hairstyles are fine as is, but can be pinned up, adorned or styled differently as well. Wrap your hair before bed in a silk or satin scarf before bed, which will help keep your hair from drying out and will keep your edges protected as you sleep. When it is time to washing your hair, pay attention to your scalp and rather than scrubbing with your fingertips, follow the lines of your cornrows or run the lather down the length of your goddess braids, whichever is applicable to your style. The same goes for conditioner and when it is time to rinse, let the water run through the hair and follow along with your fingers carefully. Be careful not to snag the hair and mess up the braids. To keep hair from being too weighed down by all the water, wash a section of goddess braids at a time if you have individuals, or half and half if you have cornrows. Blot your hair dry and wrap it in an old t-shirt rather than drying with a towel to reduce friction and keep goddess braids looking fresh longer. If your stylist has suggested a braid spray, make certain to use it as directed or ask for a recommendation. There are plenty of great options, but most people will still use a spritz of water and their favorite oil with great success. When the time comes to take down your goddess braids, the best thing to do is use conditioner. If you have very long braids installed, trim the ends up a few inches but nowhere near where your actual hair will have ended, and being unraveling the braids. Start unraveling the goddess braids from the bottom, slowly and carefully making your way to the roots. Make certain to use conditioner and water as well by applying it to the goddess braids you are removing. Conditioner provides slip and reduces breakage and stress on the strands. The extensions will come out easier and your hair will essentially be given a conditioning treatment before your final wash.
As you remove your goddess braids, you’ll see a lot of hair shedding, which is something natural, taking the fact that we normally shed up to 100 hairs a day. So if you have worn your goddess braids for a week, after taking them down you may see around 700 shed hairs, which shouldn’t frighten you. 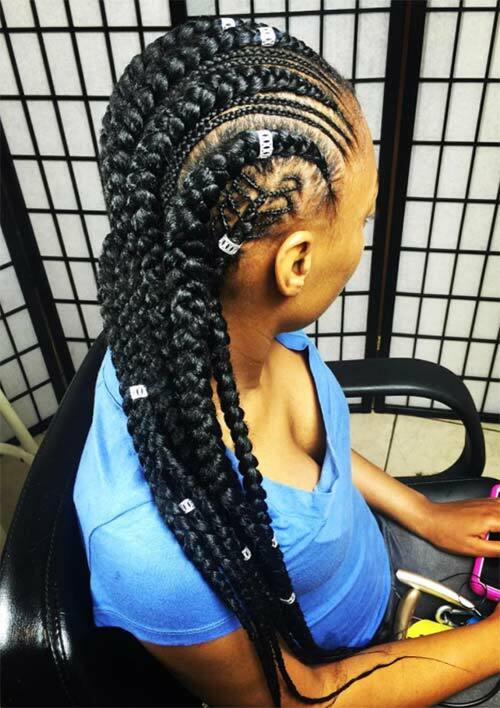 Goddess braids are known for an impressive size, weight and a myriad of designs. 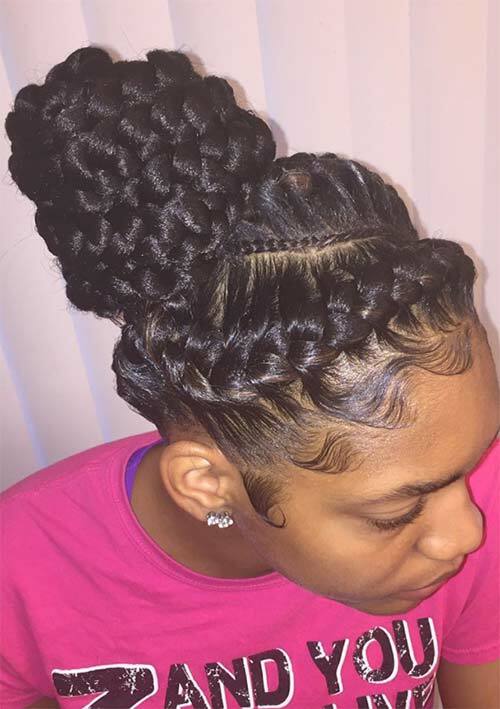 Here the goddess braided hairstyle is of cornrows that lead up to a voluminous ponytail at the crown, with cornrows that hang down in the back for a half-up, half-down style. 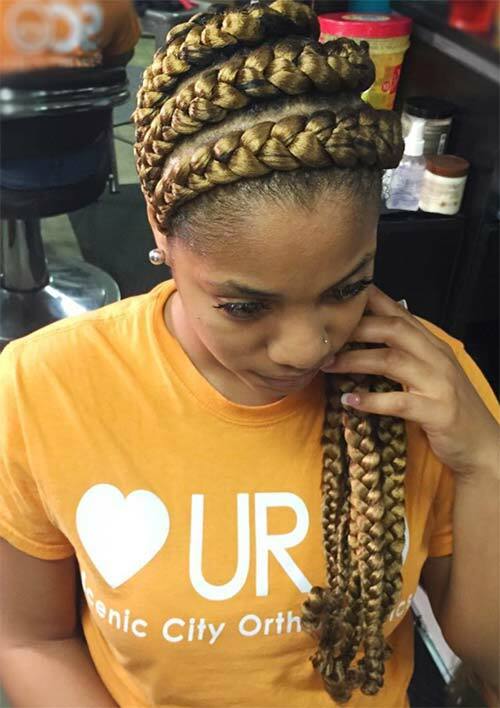 Box braids are an excellent protective style, ultimately versatile and gorgeous and here the combinations of blonde create a golden appearance to the goddess braids. Here the goddess braids are wrapped up into a stunning halo of a high bun. 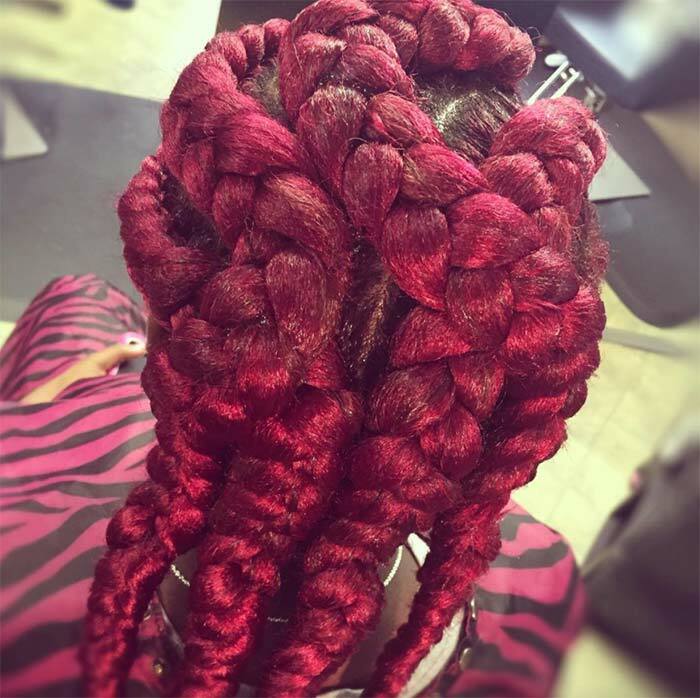 Goddess braids accented with a color can create dozens of beautiful and unique designs. Here the highlights of gold are a beautiful, eye-drawing feature of the straight-back goddess braids. The change from one size to another is clear and interesting. The slight zigzag on the parts of the cornrows looks stunning, accented between by micro cornrows designed to follow the parts. 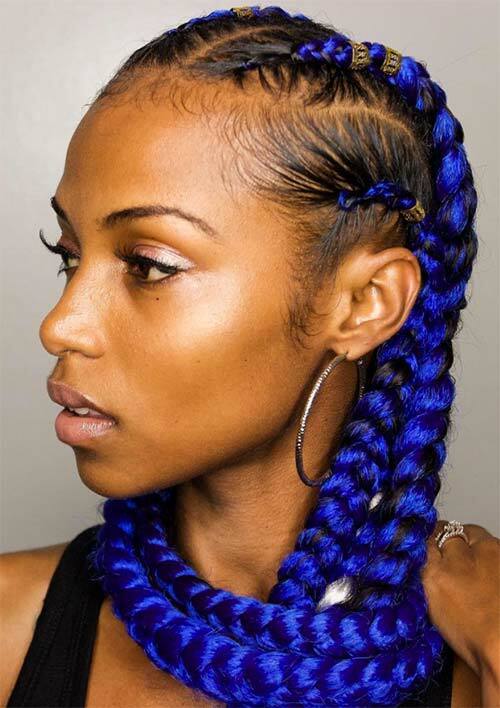 The front of these cornrow goddess braids are accentuated by gold wrap hair accessories. This style is fabulous, beautifully parted and detailed. The addition of the extension is perfectly weighted to accentuate the goddess braids without weighing down the hair. The length is perfect, the parts are perfect, and the goddess braid hairstyle is perfect. 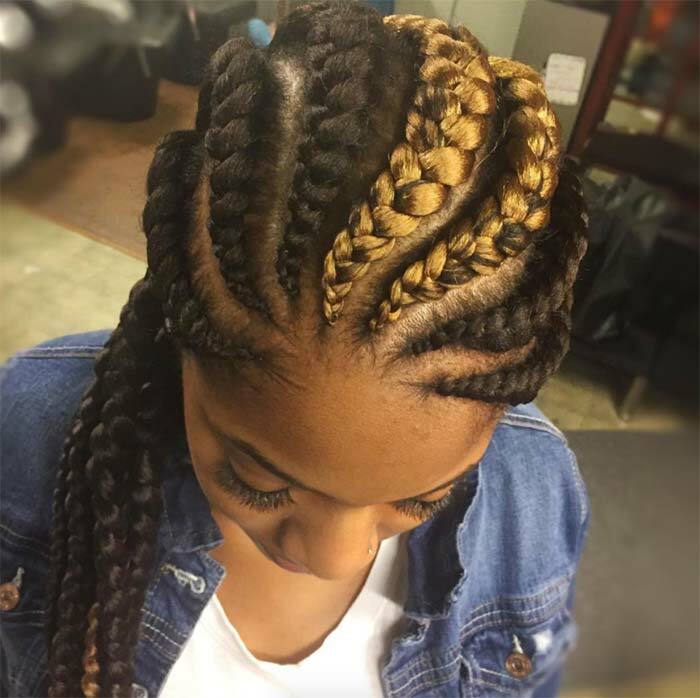 Here we have a set of detailed fishbone goddess braids on the side and tiny braids interspersed between the cornrows. The length is perfect, the size of the goddess braids is perfect and beautifully adorned with silver hair jewelry clasps. 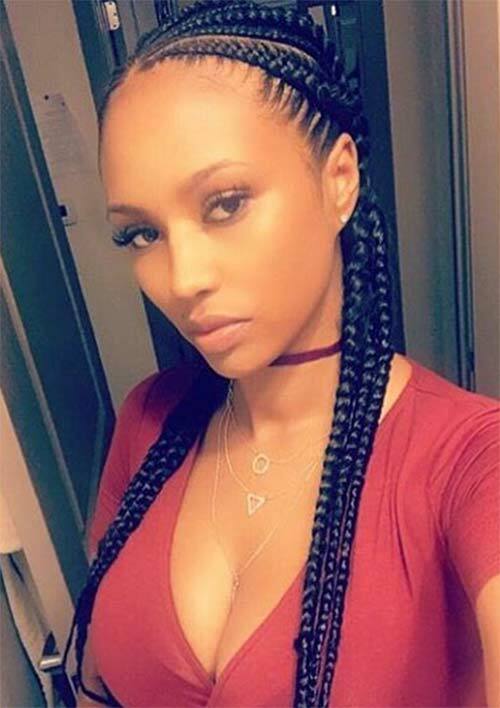 The styles that can be done with goddess braids are so numerous that nearly anything you want can be done, but there is no lack of love for the minimalistic cornrows. The aesthetic is a clean and minimalist design made to put the focus on your face. This is by far one of my favorite goddess braided hairstyles ever. The goddess braids are laced together and the decorative lace continues all the way down to the ends. This is a stunning example of a beautiful style being elevated even more with the addition of an accessory. 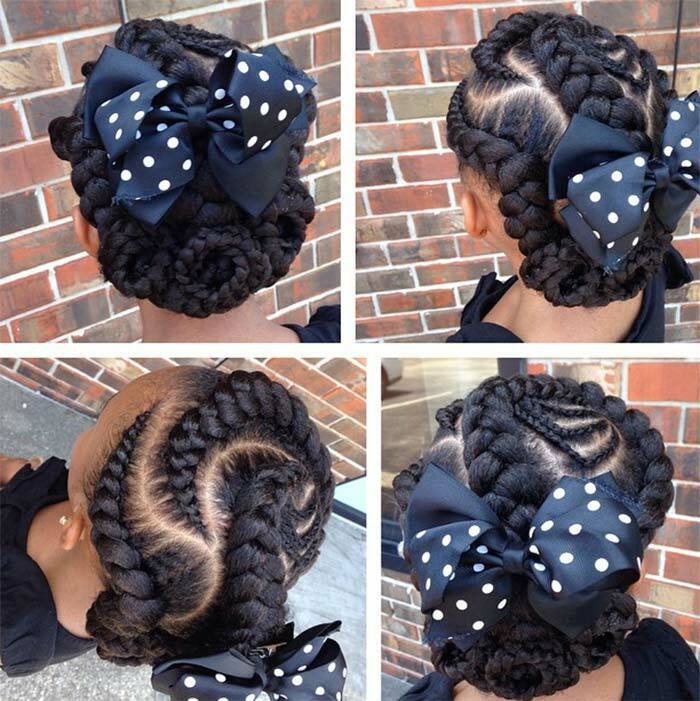 A beautiful part organizes these goddess braids into a stunning set of swirled double Dutch braids. 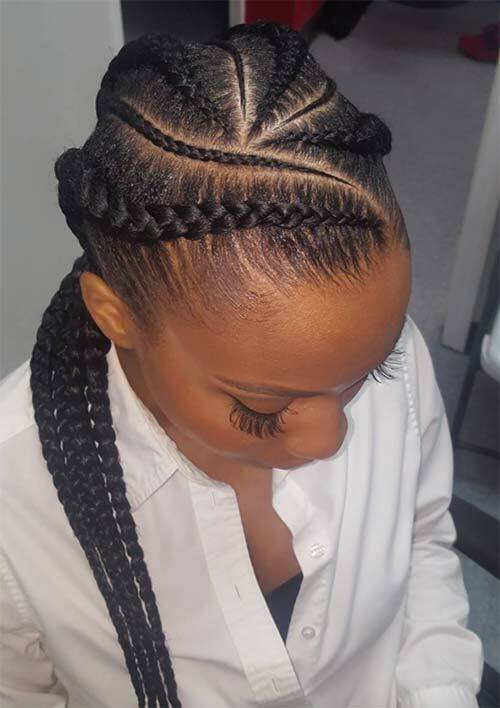 These cornrows are braided inward, allowing the braids to lie interestingly with smoothed edges and perfectly laid baby hair. A lot of goddess braided hairstyles curve around the head to create an interesting overall appearance. Here the updo is a bun in a beautiful copper-red, accented with gold hair jewelry. The long double goddess braids are done underhand allowing for a different appearance to the braids. The length is cute without being too long or cumbersome, which can sometimes be an issue with extensions. Additionally, only enough hair to make them goddess braids is used, not enough to weigh the hair down. 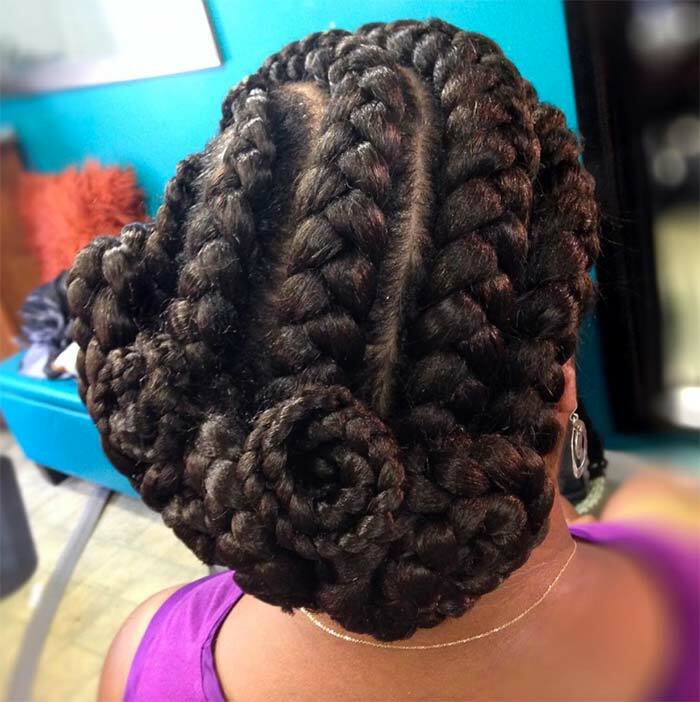 Bantu knots are another beautiful style on their own, but combined here with goddess braids, they look amazing! The lay on her edges is to die for and this style will last a minimum of two weeks. It will be easy to switch up as well. 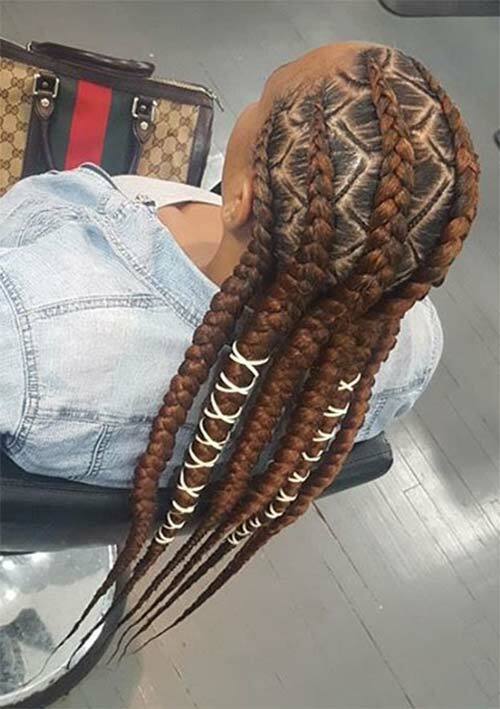 Crocodile tails, double Dutch braids and split braids have all shared the same design, but when they are done as goddess braids, the size is amped up for bigger impact. Here the addition of color also makes a big difference. 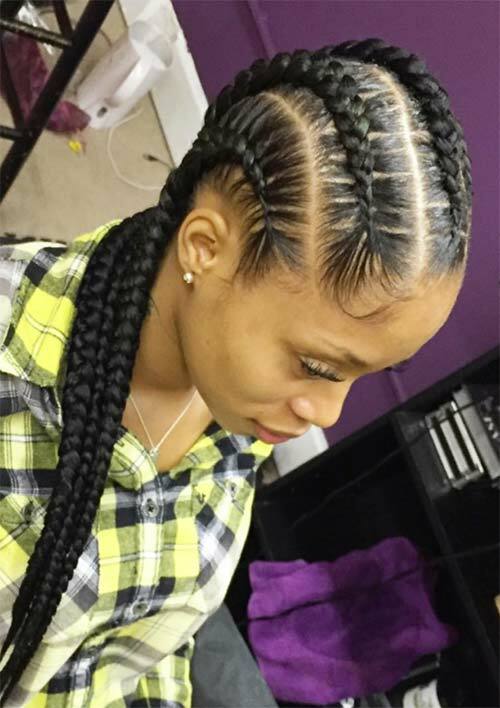 These cornrows are typically known as straight-backs and have been a fall back staple for centuries. They are quicker and easier to do, but no less impressive without the curves and curls. 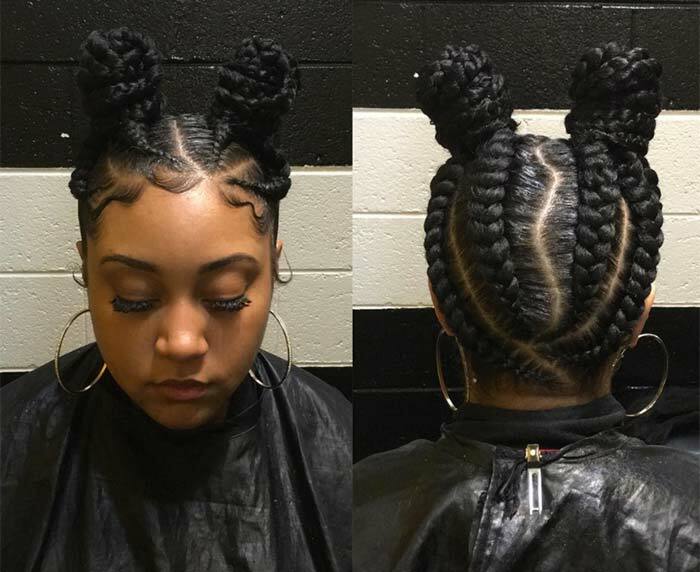 There are still plenty of goddess braid hairstyles that can be achieved with straight backs, but most notably, the way it is styled originally is easy to rock and easy to care for. 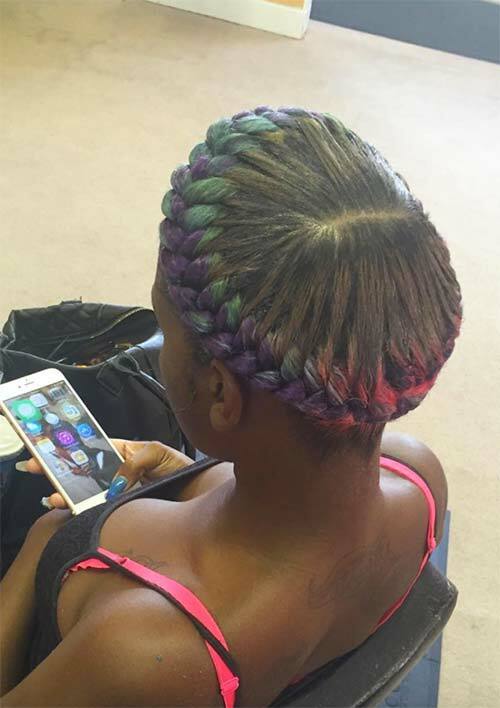 The blending of colors and the consistency of the thickness of this halo braid is awe-inspiring. 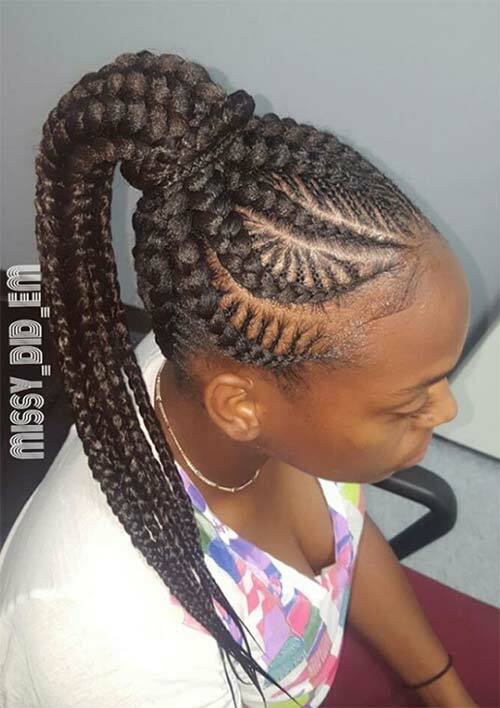 This is one goddess braid hairstyle that will look stunning from every angle and be more interesting as you see more of it. 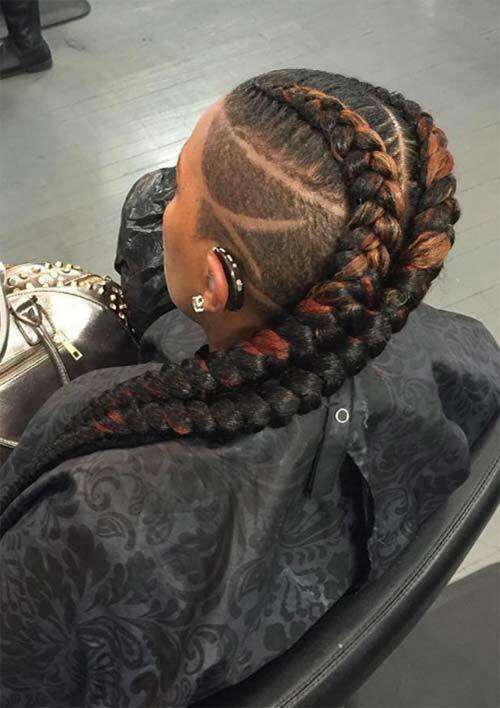 With a detailed, cared out undercut like this one, the addition of two ultra long goddess braid cornrows is a very cool sight. Cleverly this can be styled a number of ways, but worn as is will definitely show what an interesting look this hairstyle has. 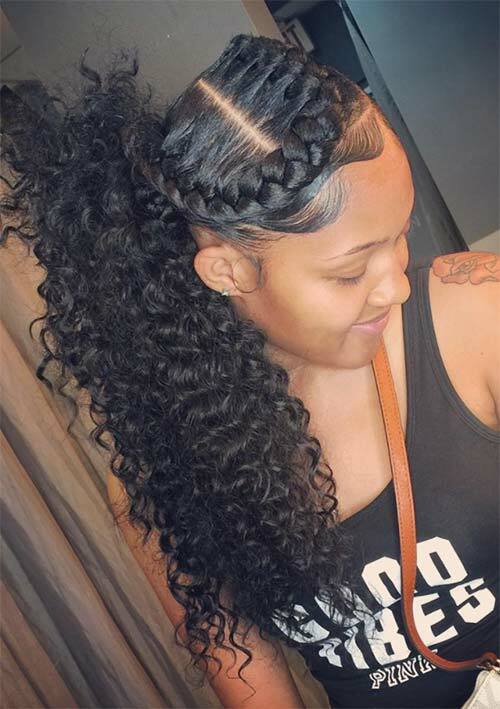 These goddess braid styles offer an ultra defined hairline and long French braids that reach way down for beautiful length the braids can be wrapped around in a crown style, spun into a bun in the back or even worn as is with much success. It is a stunning look that shows off multiple textures and a lot of detail. 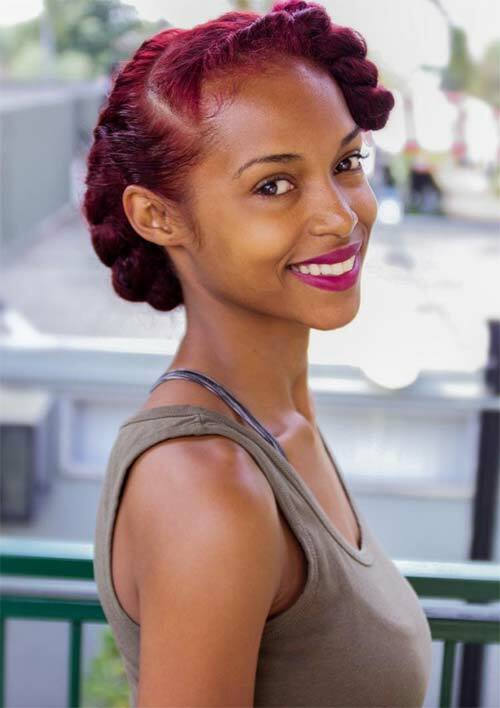 A natural puff is a great way to show off the hair texture, or even add a textured ponytail. The soft lightness of the puff provides a great contrast to the sleek defined edges and curves of the goddess braids. This goddess braid hairstyle combines several well-loved styles and shows off the beginning of an interesting trend. The half-up style features a trendy and elegant top knot and a set of ultra long double Dutch braids in the back. 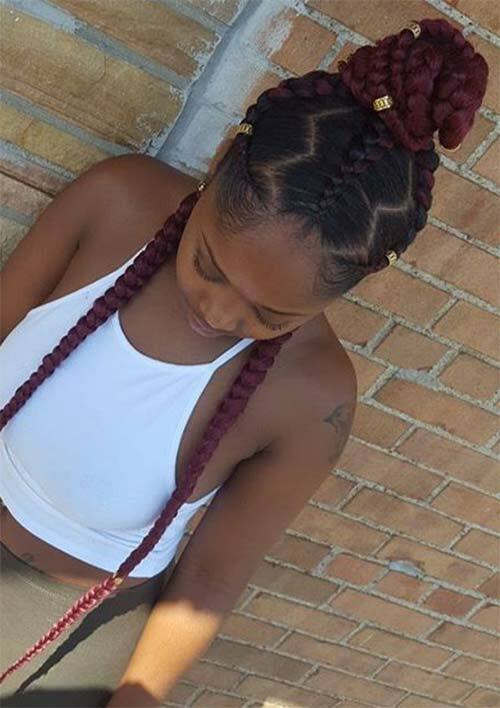 These goddess braids are maroon red and trail down to hip length. The gold adornments are perfect features to accent the deeply colored maroon and black hair. The zigzag parts and well-laid edges are stunning details that complete the look. 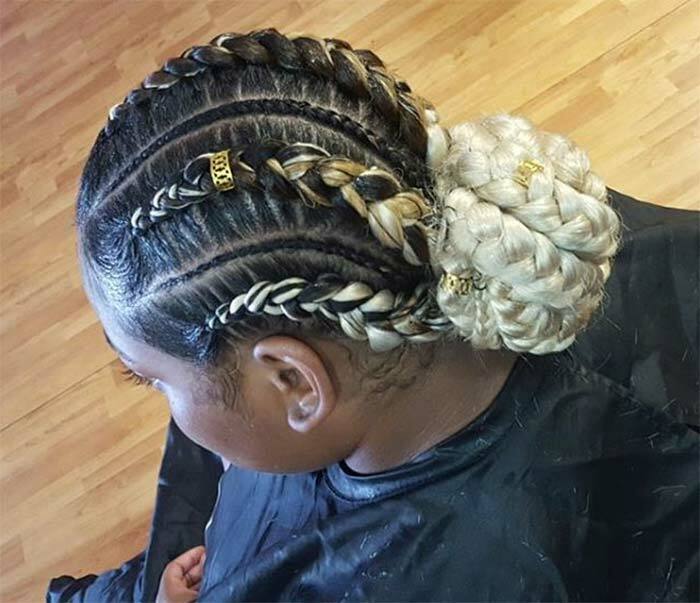 These cornrowed goddess braids feature white hair and gold accents. The addition of the white extensions means she can enjoy the look without the damage of stripping the hair down to white. The look is beautiful, and fully protective. 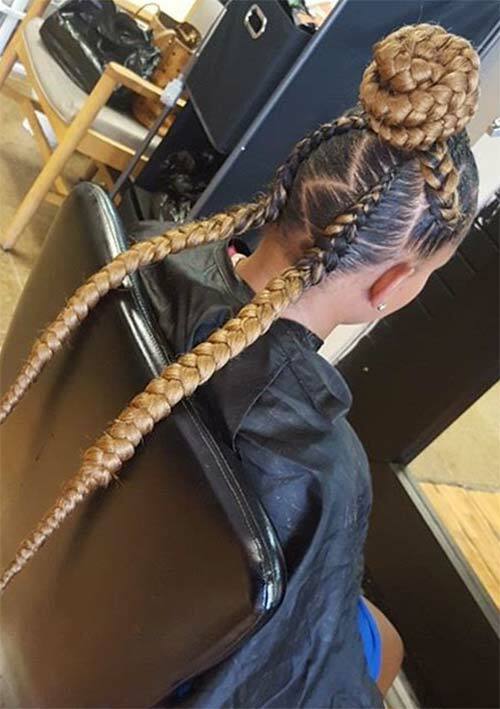 Goddess braids are known for being very large, but here they are shown next to incredibly small and intricate braids designed to accentuate the style. The twisted top bun is sleek and beautiful and can also be worn down. 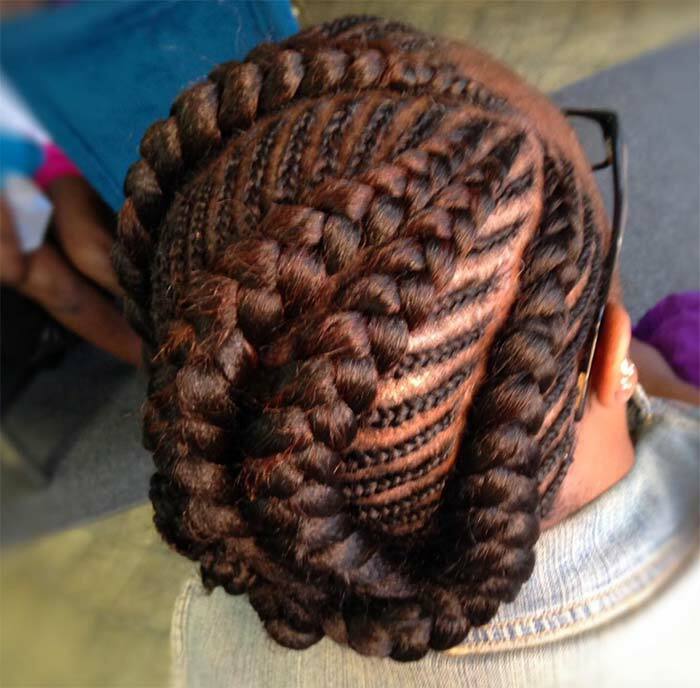 The careful installation of these braids ensures that there are no knots at the beginning of each cornrow. Braided under hand and on a curve, this goddess braid hairstyle leads into an easily identifiable top knot with a very small braid as detail. The twisted top knot is sculpted and turned in the same direction as the base goddess braids. 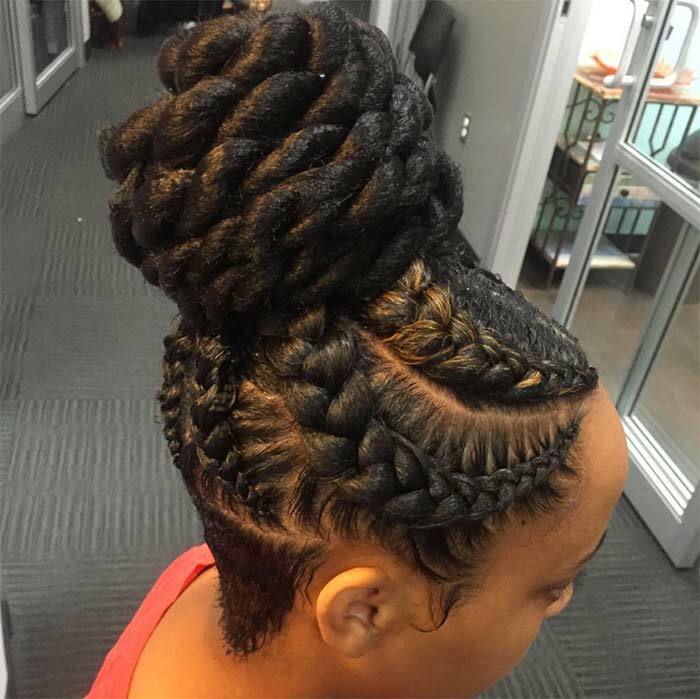 Smooth and sleek designed under-braided bun shows that even the largest goddess braids can be incredibly detailed as pictured here thanks to the close up on the laid style of her edges and the intricacies of the under braided cornrows. The swirled top knot is the perfect finish. Sweeping curves from different sized goddess braids lead into a sleek ponytail for another interesting take on goddess braid hairstyles. 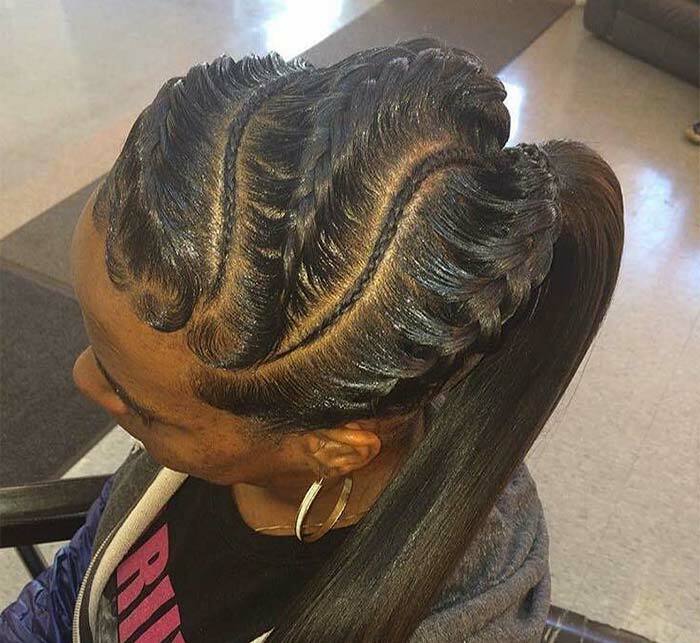 The sculpted braids sit off of the scalp, with slick edges. The long low ponytail is sleek and straight. 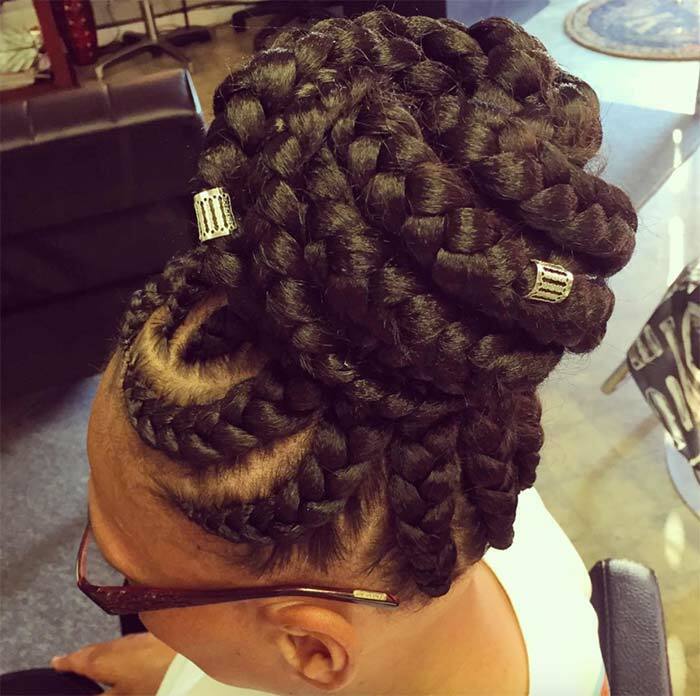 Beautifully sculpted goddess braids are a combination of style and art. 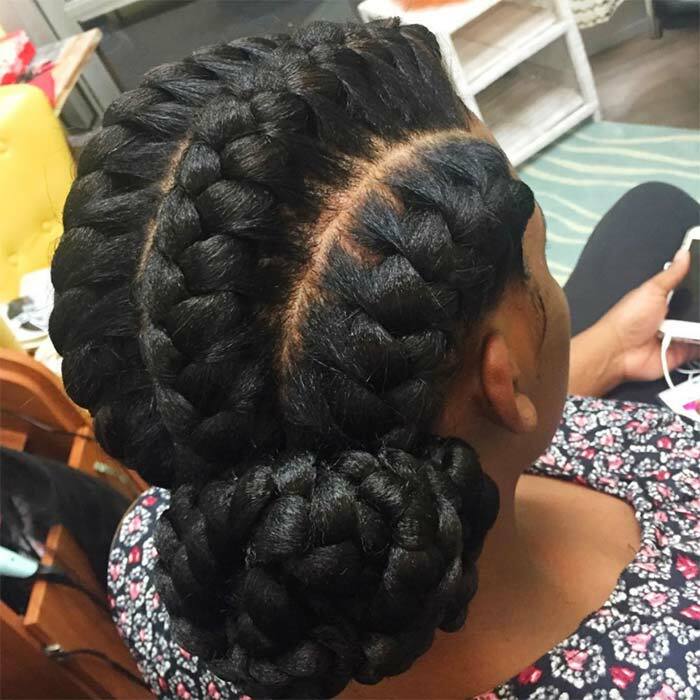 Here the cornrows are braided inward, with a consistent size and shape from beginning down to the low-hanging bun. Size matters when it comes to braiding just as with many other things. 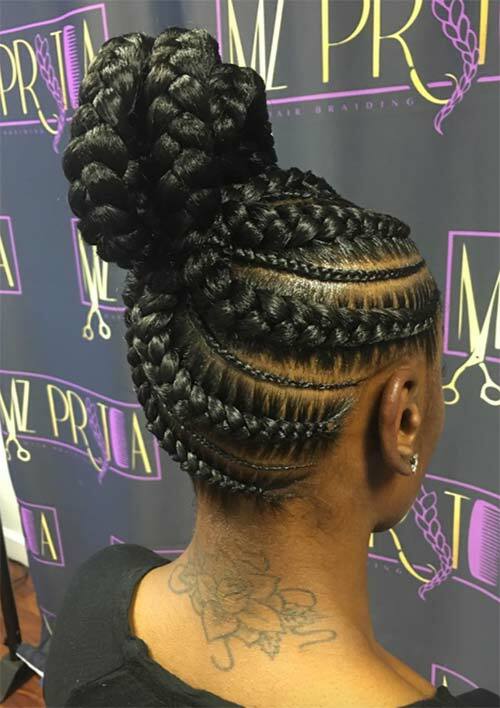 Here the even growth of the braids is marked through the entire hairstyle, juxtaposed against the smaller accent braids as they curve into a ponytail of goddess braids. Goddess braided hairstyles do not only exist in smooth-laid textures leading up to braids. 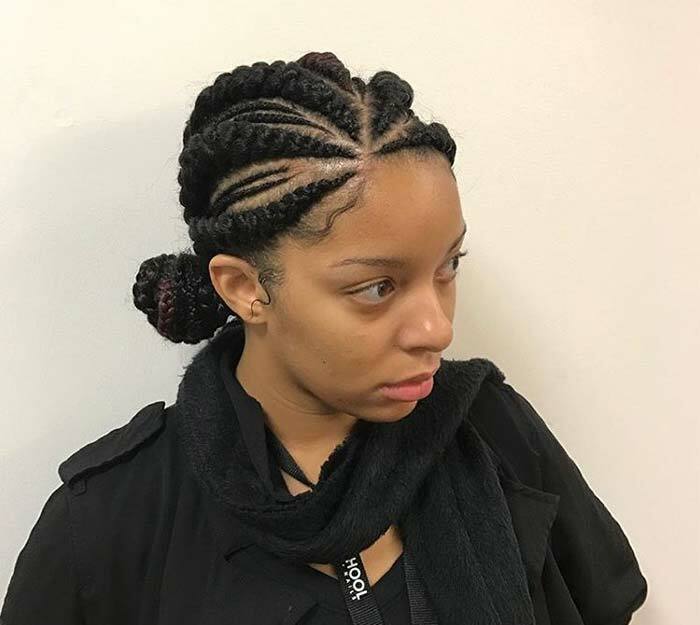 Goddess braids can also consist of textured hair, but in truth the look of goddess braids, when done correctly, can grow out to look this beautiful and maintain the stunning appearance until takedown. 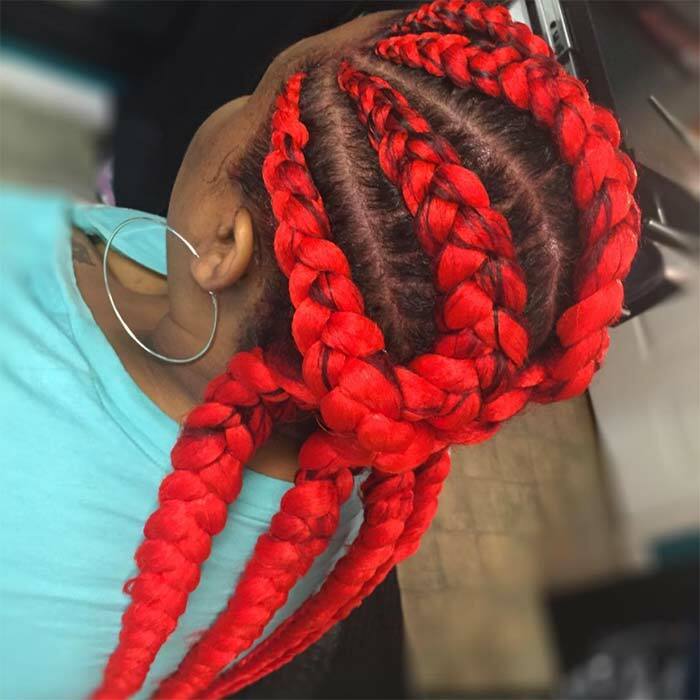 Goddess braids can be done on any length or thickness of hair thanks to the use of extensions, and here the use of brightly colored extensions only further enhance the style. The smoothed fed in style of the remainder of the braids creates a beautiful difference in texture of smooth versus braids. The particular placement of the hair jewelry adds another interesting feature to an already beautiful look. Dutch braids are not a new thing to anyone. My grandmother used to call them crocodile tails. Here the added hair creates an ombre effect from her black hair down to the bright shades of purple and ending in white. This take on Lucy Ricardo’s retro hairstyles can be done with or without adding extensions. The style is actually very simple to do if you have the patience and upper arm strength. The directions of the goddess braids are flattering from every angle, and the overall appearance is enhanced by the color. Wine tinted hair is accented with Marley hair extensions, which are known to be lighter and more textured than other options. 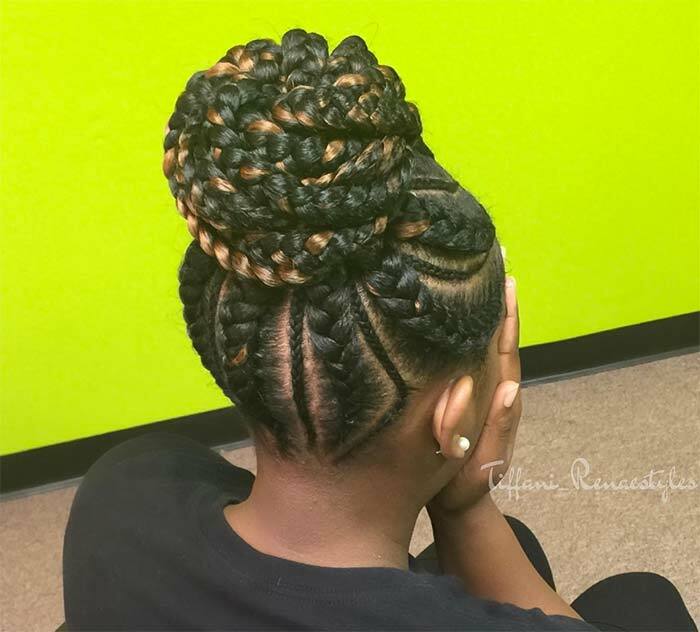 Here the trifecta of goddess braids is stunning, beautifully parted with inward braided cornrows and perfectly laid baby hair edges. A design both intricate and simple accented by a polka-dot bow looks great on any age, but here it is designed with beautiful swirled roses for buns. 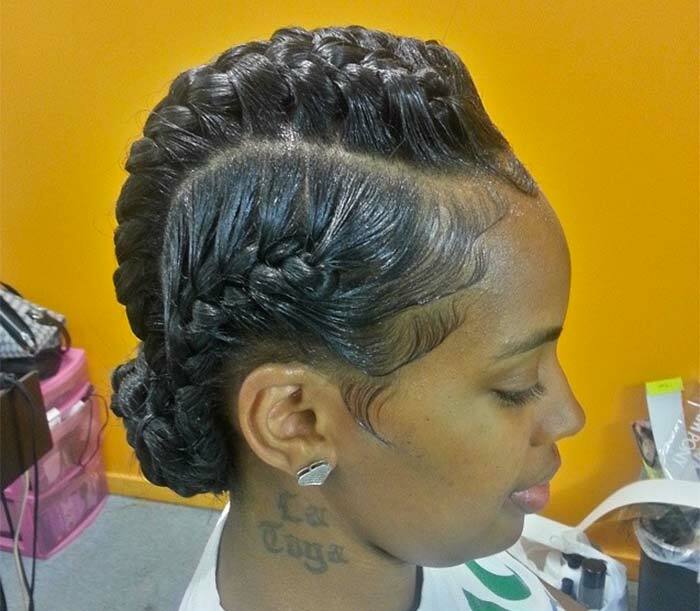 Small accent braids lead into great curving cornrows to complete the look. A large swirled goddess braid leads into a voluminous textured ponytail. The laid edges swoop around beautifully to create a sleek overall do. The style is a perfect blend between textured and smooth, braided and loose hair. 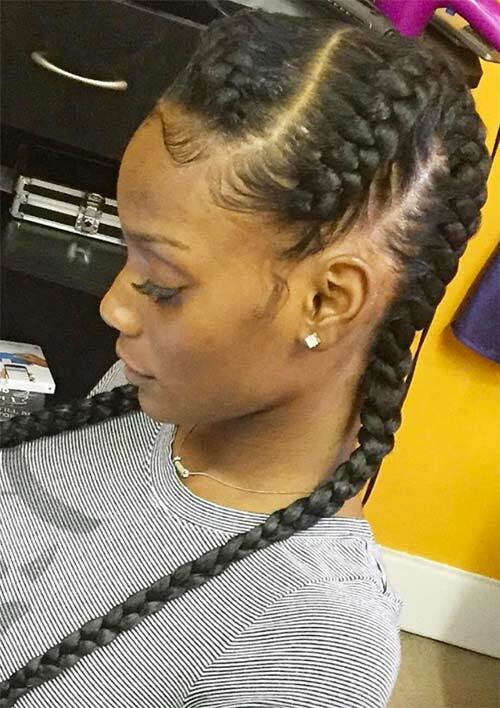 Different sized cornrows weave into a French roll in the back. The style leads up to a finished coil of braids on top of the crown of her head, a beautiful updo perfect for any occasion. A low bun is a great style for work and play. 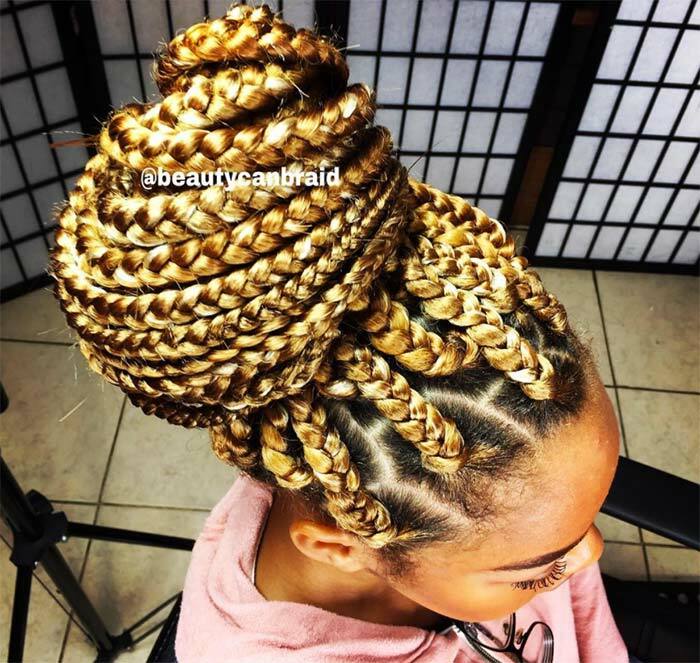 The underhand direction that the cornrows are braided in offers a different perspective once the goddess braids end, wrapped into a chic low bun. Golden goddess braids are directed in a side-swept style. This particular design neatly pulls in the edges presenting a smoothed hairline that is nothing shy of perfection. 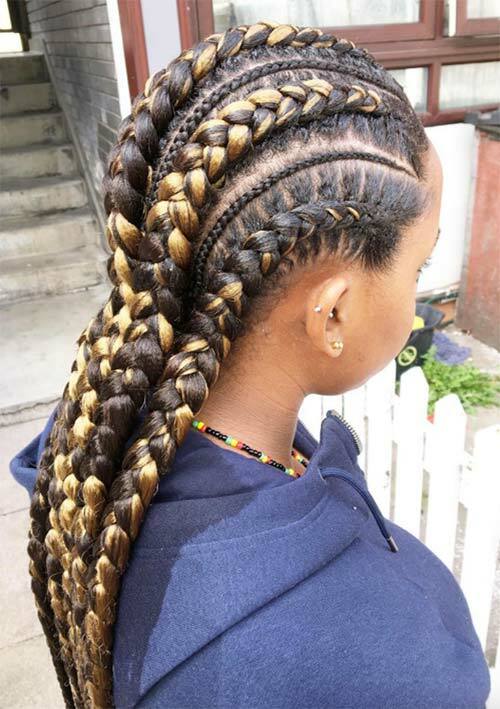 A light curve on the design of these goddess braids is accented by two golden braids near the center. 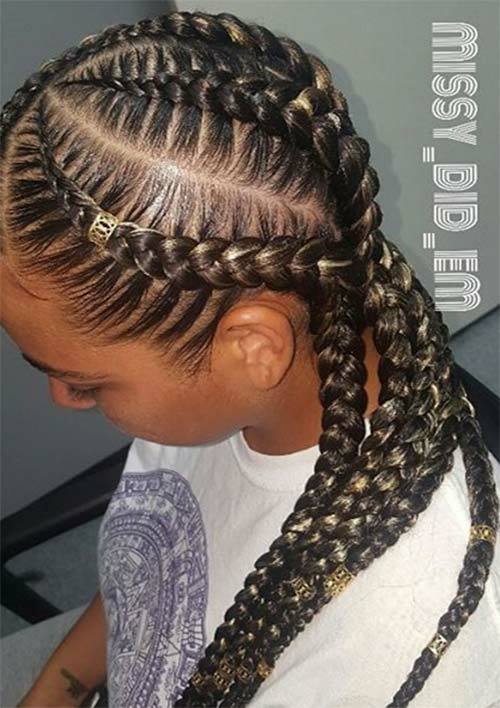 The feed-in style of the cornrows helps the shape of the design be accented thanks to the thickness of each braid. Bright colors and goddess braids have gone hand in hand many different times with beautiful results. The addition of the richly pigmented hair beautifully merges with her hairstyle. In keeping with the larger style of the larger goddess braids, the top knot is designed beautifully high. Sections of the braids are adorned with silver hair jewelry, but the bun can be unwound for a beautiful high pony. The larger goddess braids are no less dexterous, being wound around into several different designs. Here they wind and cross over each other to create a swooping design on the front and side, and fall straight down the back. Fish-bone goddess braids feature smaller cornrows directed to turn into larger goddess braid cornrows. The smaller braids lend into the design of the larger, creating an intricate and beautiful look. Goddess braids and buns are a beautiful combination that creates an elegant updo. The overall style is neat and clean, clearly artistic and beautifully designed. Goddess braids swirl in a pattern around her head to end in a swirled chignon at the bottom. Each of the lengths of the cornrows is curled and coiled and pinned into the beautiful bun at the nape of her neck. It is an upscale and beautiful look. 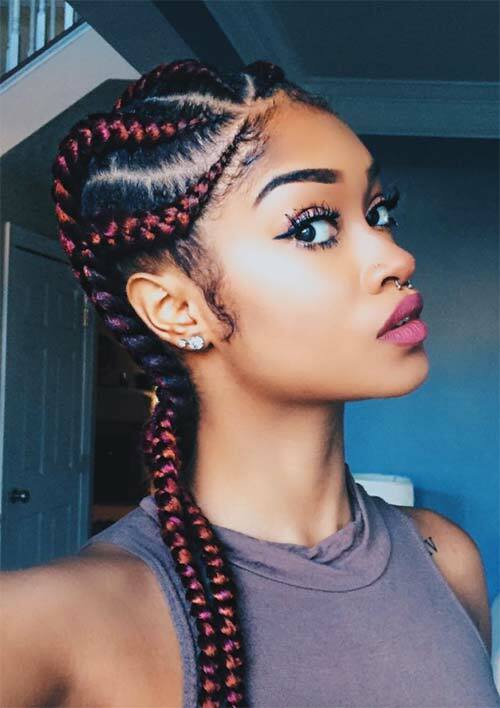 Swerving cornrows make up this goddess braid hairstyle, and the overall effect is amazing, especially considering that this style contains only four cornrows. They cross over and curve around beautifully to create this trendy look. This is a beautiful updo of folded in and dangling braids with a base of underhanded cornrows fed with extensions. It is interesting and complex while still being understated and lovely. There is a wide variety of goddess braids designed to lead up into a ponytail or a bun. The option to wear it either way is one of the best benefits of the style. The looser or tighter the bun, the difference in size is visible, and here, if the ponytail is released, it will hand down and cover her undercut. 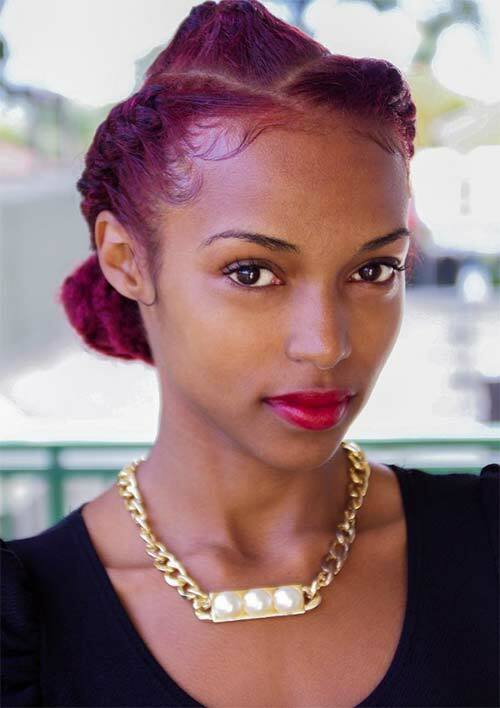 The coppery red stands out beautifully against the black in her hair and the feed-in style is perfect. The size graduates beautifully to create steady lengths that drape down the back. Even her edges are tucked in neatly making this a great choice of goddess braids. 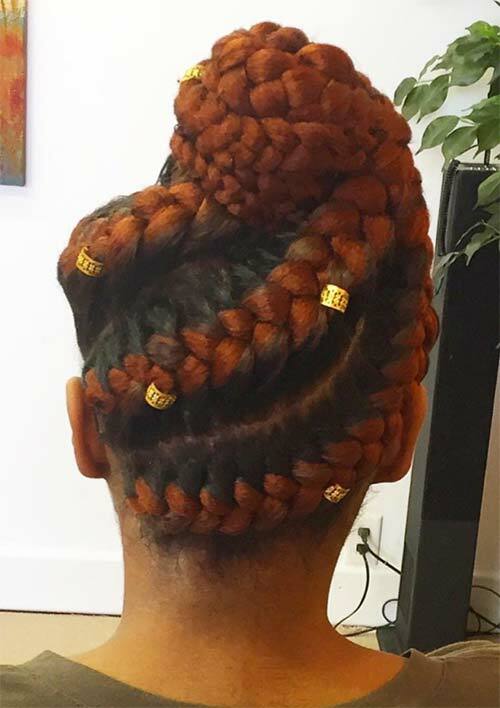 Perfect parts abound in these feed-in cornrowed goddess braids. The addition of the white blonde streaks is lovely as they peek through the braids. The gold colored hair jewelry is the final stunning touch. 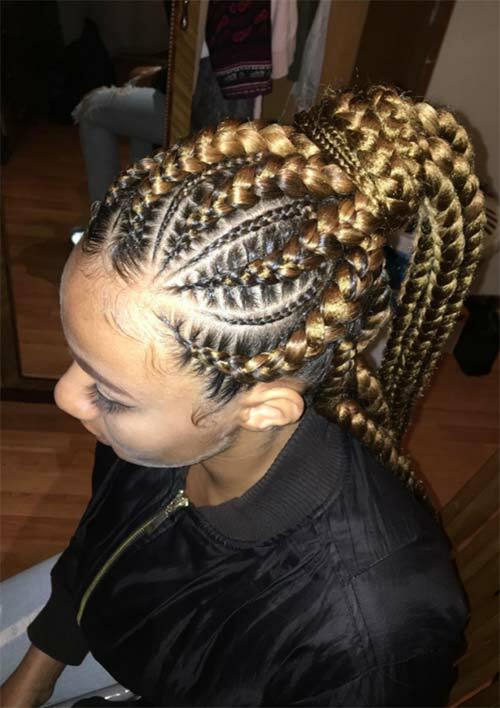 Large feed-in cornrows are accented by smaller, more intricate braids that follow along the curvature of the goddess braided style. This is a beautiful example of minimalism and can be adorned a number of ways or worn as is. This is a style designed to be sleek and beautiful and from root to tip it certainly is. The lace-up adornments on the goddess braids are incredible. For a dressier look, the lengths of the cornrows can be wrapped around several different ways, each beautiful and interesting. 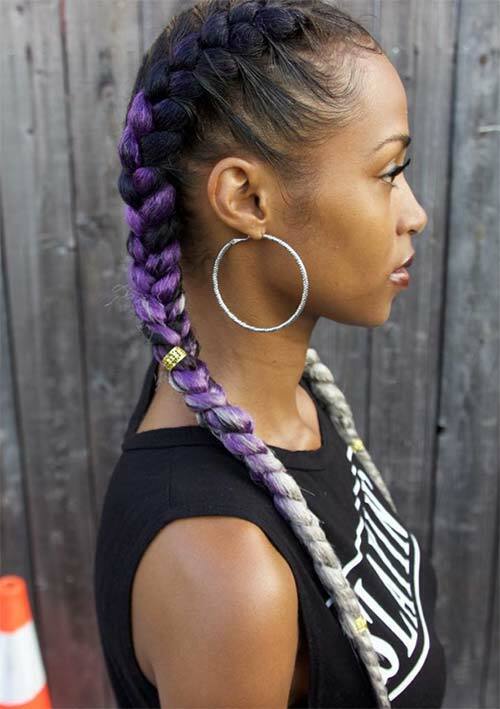 Adding in color with extensions is a great way to add extra flair to your goddess braids. 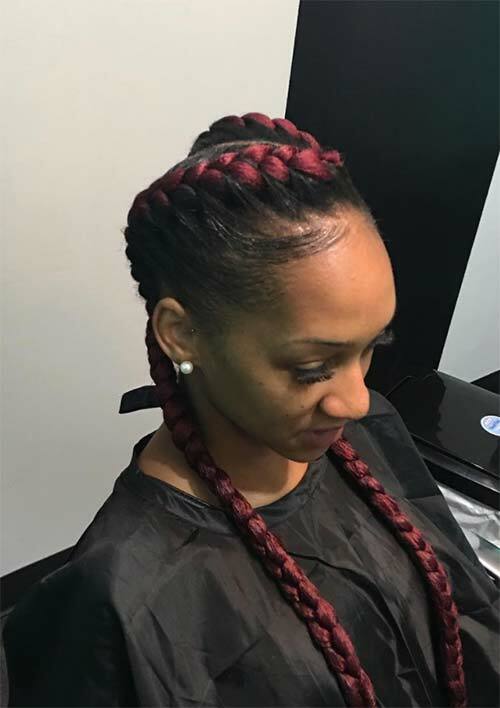 As a protective style with the added color, you can be assured that you have done no further damage to your hair while rocking an easygoing style that will last you a while. 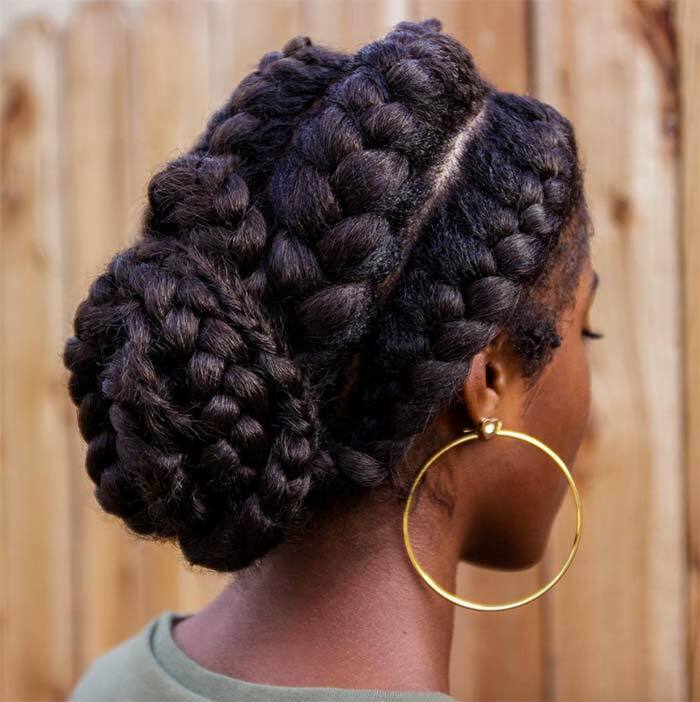 The high ponytail can easily be turned into a gloriously sized bun, but the real eye-catching detail here is the micro cornrows that feed into the Ghana braids. The curves on the Ghana braids are beautiful, creating movement even where there is none.